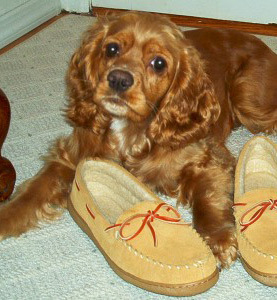 Cocker spaniels are descended from spaniels, one of the oldest breed of dogs. Spaniels have become a part of history in stories by Chaucer (1342-1400), Shakespeare (1564-1616), and even played a part in England’s separation from the Catholic Church when Lord Wiltshire’s cocker spaniel bit Pope Clement VIII on the toe. In the end, Henry VIII severed his relations with the Catholic Church. Spaniels may have arrived in England during Caesar’s invasion (54-55 BC). It is assumed spaniels originated from Spain as the word spaniel may be derived from Hispania (Spain) or possibly from the French phrase Chiens de l’ Espagnol (Dog of Spain). Spaniels were especially bred to flush game out of dense brush. By the late 1600’s spaniels had become specialized into water and land breeds. The English water spaniel (extinct) was used to retrieve water fowl shot down with arrows. Land spaniels were comprised of setting spaniels—those that crept forward and pointed their game allowing hunters to ensnare them with nets, and springing spaniels—those that sprang pheasants and partridges for hunting with falcons, and rabbits for hunting with greyhounds. During the 17th century, the role of the spaniel dramatically changed as Englishmen began hunting with flintlocks for wing shooting. Goodall & Gasow (1984), write the spaniels were "transformed from untrained, wild beaters, to smooth, polished gun dogs." Springing spaniels would lay the foundation of all modern day flushing spaniels. In a single litter of springer spaniels, the larger pups would become springer spaniels, the smaller pups would become cocker spaniels, and the medium-sized pups would become Sussex spaniels: Size alone was the only difference. American hunters found great sport with spaniels at their side as written by Jeff Griffen (1964). But the spaniel is at his best as a hunter with his master gunning over him. From the hayfields and weed patches of New York, New Jersey and Pennsylvania to the brome grass of Illinois and Ohio, from the cornfields of the Dakotas to the rice stubble of California the spaniel provides the finest sporting hunting there is. Perhaps this sounds like a bold statement, but the spaniel flushes his game, thus the hunter is never as completely prepared as he is with a pointing dog, and the bird has an even chance of escape. Spaniels are not quail dogs but they are superb on pheasant and woodcock; even on grouse they are hard to beat. Before 1892 cocker spaniels were not specifically bred as such or recognized as a separate breed by the English Kennel Club. 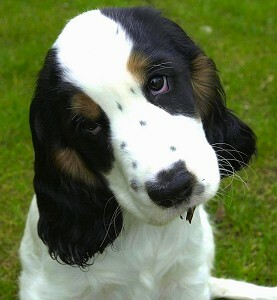 One litter of springer spaniels would produce three types of dogs (springers, Sussex, and cockers). Bench shows in England were confusing as pups would be entered as cockers one year and springers the next year as they grew larger. The prototypes of modern cocker spaniels were Obo (1879), predecessor of today's English cocker spaniel and Obo II, considered father of American cocker spaniels. Obo was the offspring of a Sussex spaniel sire and a field spaniel dam (field spaniels are related to springers). The difference between English and American cocker spaniels is the latter was bred more for showing than hunting. As Author Jeff Griffren wrote, "the American variety became smaller and more beautiful" while the "English version grew rangier and stronger." Indeed, English cocker spaniels more closely resemble their springer spaniel ancestors. It seems necessary to explain the practice of tail docking since it has been used on cocker spaniels throughout history. Most archived photos and drawings illustrate the cocker spaniel with a docked tail. That is one-half to two-thirds of the tail is removed. Breeders would use a sharp pair of shears for the task. The reason tails were docked was to prevent injury as the dog ran through heavy brush while flushing game. However, today's cocker spaniels are kept mostly as pets rather than hunters. Tail docking does have effects on the animal. Even when performed by a veterinarian, the animal is seldom anesthetized by local or general anesthetic due to the risks involved. The procedure is painful causing stress to the animal. There is always the risk of infection and possibly death from the procedure. Other risks include hemorrhage, meningitis, chronic pain or loss of sensation. Tail docking also effects the dog's balance and gait: "Because of its docked tail, the Cocker Spaniel resorts to a spread stance for static balance." It seems tail docking has behavioral effects on dogs as well. Psychologist Stanley Coren states dogs with docked tails seem to be victims of aggressive encounters with other dogs. Apparently, dogs use their tails as part of their body language when communicating with each other. Dogs with docked tails unintentionally send out mixed signals to other dogs resulting in aggressive attacks. One of the most influential American cocker spaniels of the 1920s. During the early 1900's American cocker spaniels captured the hearts of the world for the first time. In 1921, an American cocker spaniel became the first of its breed to win Best in Show at the Westminster Kennel Club Dog Show. The reason is quite clear if you ever owned an American cocker spaniel but Jeff Griffren said it best: "The smallest of the sporting dogs, with floppy ears, large, soulful eyes and joyful disposition that always responds to affection, the Cocker Spaniel is one of the most lovable and popular dogs on earth." In fact, the public was so enamored with the American cocker spaniel that it held the number one position in the American Kennel Club (AKC) registrations for a solid 16 years in a row; a feat that no other breed has accomplished. But the price of fame was high for this little spaniel. Those interested in profiting from the American cocker spaniel's popularity began careless, unsafe, and unethical breeding of these animals. Puppy mills began churning out "cockers" by the thousands. The once healthy and merry breed became plagued with hereditary diseases such as eye disorders, hip dysplasia, and temperament problems. For example, while some breeds may have a paragraph or possibly a half a page describing their eye disorders, the American cocker spaniel has 10 pages according to veterinary eye specialist, Dr. Allen Bacharach. The term "cocker rage" came into common use describing temperament problems. What was the public's response? The once number one spaniel slipped out of the AKC's top ten altogether. Fortunately, the English cocker spaniel has changed little over the years; health disorders and temperament are not so much an issue. I recently went on an on-line adoptable pet database and was disheartened to discover over 1,000 homeless cocker spaniels in the U.S. It is clear the American public is no longer enamored with their cocker. However, puppy mills and backyard breeders continue to prey on the American cocker spaniel squeezing every last cent they can out of them. Breeders of cocker spaniels control the health and temperament of the breed. Some breeders of cocker spaniels, like Trish Jackson, are attempting to revitalize the breed. Trish is breeding her spaniels for the qualities the original American cocker spaniels had--well bred hunting dogs, like their English counterparts. With hard work and the love of the breed, Trish Jackson was able to produce the first American cocker Field Trial Champion since 1960. It appears that "show" cockers suffered most of the effects of poor breeding. Hunters such as Jeff Griffen prefer hunting with field-trial bred cocker spaniels as "show" cockers suffer from "shyness and hysteria to a serious degree." To cocker spaniel breeders I offer this challenge. Breed for the love of the breed and breed the cockers we all know and love. Berger, J. (Excutive Producer). (2001). Breed all about it: Cocker spaniel. Maryland: Animal Planet. Coren, S. (2001). How to speak dog. New York: Fireside. Goodall, C. S., & Gascow, J. (1984). The new complete English springer spaniel (3rd ed.). New York: Howell Book House. Gordon, J. F. (1967). The spaniel owner's encyclopaedia. London: Pelham Books. Griffen, J. (1964). The hunting dogs of America. Garden City, NY: Doubleday & Company. Grossman, A. (1988). The American cocker spaniel. San Jose, CA: Dural Publishing. Sucher, J. (1999). Cocker spaniels. Hauppauge, NY: Barron's Educational Series. Wansborough, R. K. (1996). Cosmetic tail docking of dogs. Australian Veterinary Journal, 74 (1), 59-63. Webster's new collegiate dictionary (1981). Springfield, MA: Merriam-Webster. This website gratefully acknowledges Doral Publishing for use of Red Brucie's drawing which appears in The American Cocker Spaniel by Dr. Alvin Grossman © 1988. Special thanks to the owners of Sidney and Jessie for use of their photos. The origin of all domesticated dogs may have come from the wolf. Research conducted by geneticist Robert Wayne has shown that DNA of domesticated dogs and wolves differs by only 1%. It is theorized that wild wolves associated with early man eating left over food in his camps. This relationship grew when wolves offered man protection in return. Eventually, wolves adapted or were selectively bred to serve the purposes of man transforming them into the many breeds that exist today.